❤Material: zinc alloy with plating treatment, fadeless and eco-friendly. ❤Assorted Styles: mixed designs and sizes, can be used to make different styles of bracelets. ❤Large Hole Beads are Suitable for: bracelet beading, jewelry making and other crafts, perfect to add on the bracelet or necklace. 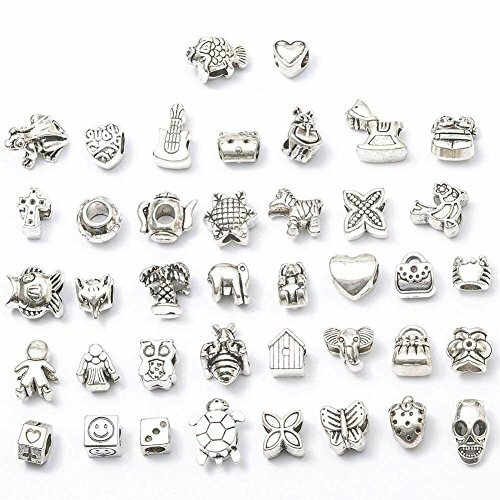 ❤Package includes: 80 pcs Tibetan silver metal beads, approximately 6 oz. These beads were perfect for a custom bracelet I made for my sister in law’s birthday. I will definitely be purchasing them again! I loved the variety included in each pack.